Christmas is going to bring me to tears this year. It has happened for the past several years, and I’m ready for it. Any time a baby is born, that is a time to rejoice. 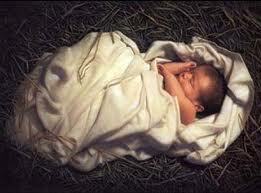 God has brought forth into the world a tiny baby, one who has been formed and knit in a mother’s womb. That’s a miracle. Grandparents, aunts, uncles, nieces, nephews, and more gather around to welcome this child into their family. A baptism brings even more joy as the child becomes part of the family of believers. At those times, my arms ache for a child I also wish to hold. I ache to nestle a child close to me and ponder her future. I wonder when it will be my turn to parent a baby. Will there ever be a child for me? On Christmas, we celebrate the birth of another child. However, it’s not just any child; it’s the birth of Jesus, the Christ-child. This is the child who would endure the most difficult life ever. This child would be spit upon, scorned, bruised, beaten, rejected, and nailed upon a cross to die. This child would be mentally tested time and time by the devil, who would seek to ruin Him. This child would defeat sin, death, and the devil for you. This child is preparing a place for you in heaven. This child stands in your place before the Father and covers your iniquities. There is nothing within us that deserves any of these gifts. But Jesus, the Christ-child did it anyway because He loves us. And that’s what brings me to tears. Christ became a baby for me. He lived a perfect life for me. He died for me. He rose for me. Now He lives for me. My tears at Christmas are tears of repentance and tears of joy. So rejoice, dear sister, there is a child for you. The words of the Christmas angel are meant for you, “You will find Him wrapped in swaddling cloths, lying in a manger.” (Luke 2:12) Christ the Savior is born FOR YOU. Posted in Church, Infertility on December 23, 2011 by Kristi Leckband.